Meet Princess Paris and her beaded leash. The title of Princess applies to this dog more than any other dog I have met. I certainly do not tell her any different, however, because she is the sweetest most well behaved dog on the planet, most of the time. 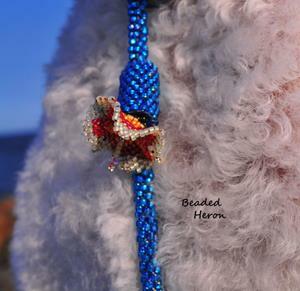 Paris is so well behaved, that she deserved for me to make her this beautiful sparkling beaded leash with a beaded flower accent. Not just any dog should have a beaded leash. 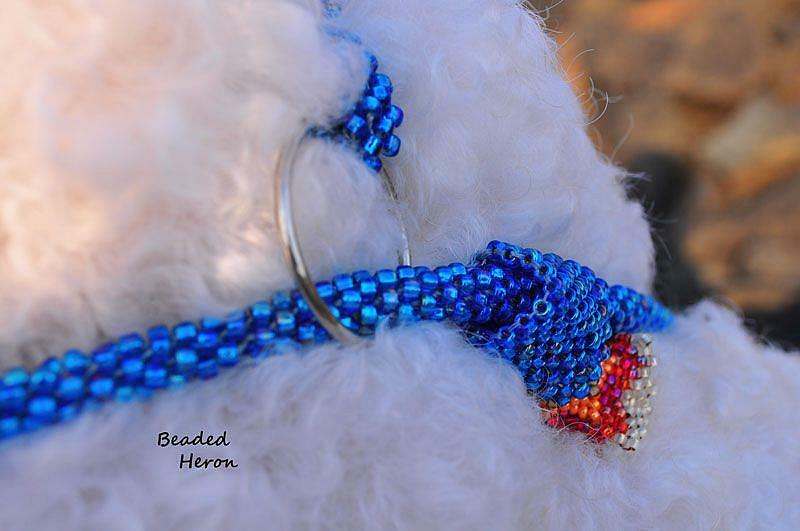 A dog that pulls or needs stern correcting tugs should not wear any beaded leash, but since Paris walks beside me or slightly ahead, and she never pulls tugs or puts any sort of pressure on her lead, it is OK for her to wear this fine piece of Poodle Jewelry. Actually, she can finally stop borrowing my jewelry now that she has her own! I have been known to let her borrow beaded necklaces that I made for myself on occasion, if we were going somewhere special. 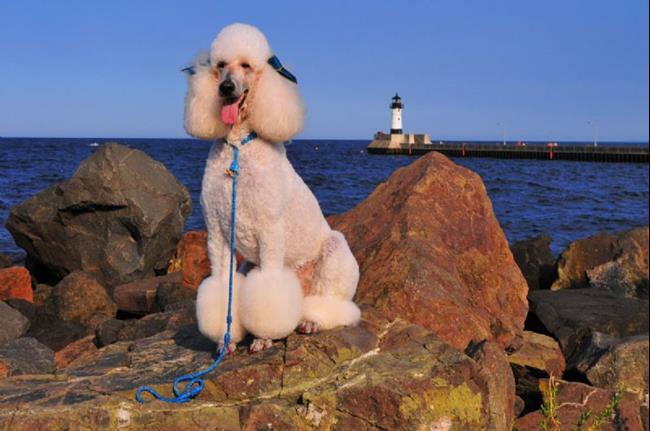 The art of sculpting poodle hair is lost on most folks unless they too, are owned by a Poodle and even then, if you have never attempted hair sculpting, it is actually quite difficult. I do about 80% of the work on grooming Paris as of this writing and with any luck in a few months I will be doing it all. Paris loves to be groomed. We have shave face and feet and bath and dry time time every 10 days or so, and a fresh groom about every 4 weeks. During these hours, Paris is the center of my attention, thus her adoring appreciation of it all. After each of our grooming sessions, Paris has come to expect a photo shoot. She loves to pose for the camera and this ritual has become something she looks forward to so we get in the car and find a scenic spot and I take dozens of pictures while she sits and smiles and poses. Comments such as "look, that dog knows it's a model" are commonly heard. If we go somewhere with more than a few other people, by the time we leave, Paris's freshly bathed and fluffed topknot gets plenty smooshed by kids and adults alike. Kids love to touch her soft cottony feeling hair, and the adults can't resist either. All of this lends to the "Princess Syndrome" that is my funny girl, but I wouldn't have it any other way. If we happen upon a place that has LOTS of people, say a thousand or so, Paris is sure that all of them are there to see HER. It is all quite hilarious! I had long wanted to make Paris a beaded leash, and was finally propelled to do so for the Dog and Cat show this month. 76 inches of beaded Kumihimo braiding was used to make this leash. Kumihimo is an ancient form of Japanese braiding. Kumihimo cords were used by the Samurai to hold together their armor and their horses armor, and in this case I added beads. Eight strands of strong cord, each about 25 Feet long, were strung with thousands of seed beads. I then wrapped each 25 foot bead strung cord onto spools and intricately braided them together on a loom. The collar and leash and handle are all one piece, with the morning glory sleeve acting as a stopper for the slip ring and contrasting accent. The leash took about 30 hours to make.